PPCGeeks.com – An iPhone? No way! On Verizon? Where?!? An iPhone? No way! On Verizon? Where?!? No need to unlock and flash a custom ROM, no need to soft-reset, Just click your app and BOOM – it opens. Now I will admit that there are several major problems with the iPhone like the OS, the network, the battery being fixed, no hardware keyboard among others, and I would never get one. And yes, some of these problem can be fixed with aftermarket products. And I have several on my iTouch. But the one thing I have never seen a fix for was the network. Still leaning out of my window to get a 3G fix. Well, until now. 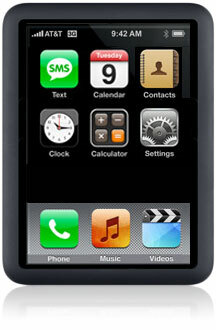 According to the iphoneblog, Apple is making a smaller, CDMA compatible “World Phone” for Verizon. It is supposed to arrive Q3 of 2010, but may be later. So the real question is, now that we are getting a phone that just works, on a network that just works, who is going to be switching? Leave your thoughts in the comments.